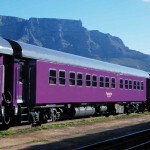 Shosholoza Meyl Premier Classe deluxe trains travel on routes Johannesburg – Cape Town and Johannesburg – Durban on a weekly schedule. 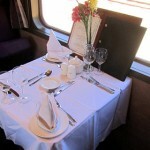 Included in the fare is bedding, amenities, breakfast, lunch and dinner. 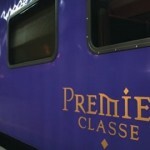 Premier Classe trains offer air-conditioned sleeper coaches with single-berth coupes, two-berth coupes, family compartments, communal lavatories and showers. 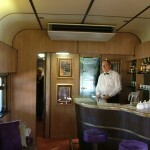 Premier Classe trains are air-conditioned. 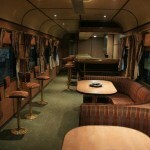 Bedding, luxury amenities and towels are included in the fare. 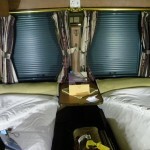 Single passengers travel in a single-berth coupé by themselves, Two passengers, (if related or booked as such), travel in a 2-berth coupe, Families (with kids up to 9 years of age) travel in 4-berth family compartments. 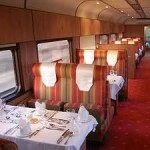 Premier Classe trains have a special restaurant car and a Premier Classe lounge car with TV. 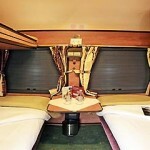 Each sleeper-car has lockable lavatories and shower cubicles with a changing area at the end of the corridor. 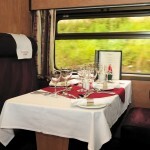 The fare includes a classy meal package starting with tea/coffee muffins at the Premier Classe lounge, a welcome reception on the train, breakfast, 4 course lunch, high tea and five course dinner. Tea/coffee and juices are also included in the package, while sodas and alcoholic beverage are charged for. 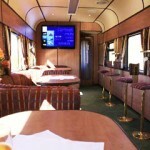 Premier Classe passengers use the Premier Classe VIP lounges at the Cape Town and Johannesburg stations to check-in. 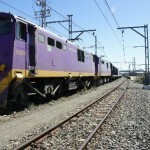 Motor car transport for private cars is available on routes Johannesburg – Cape Town and Johannesburg – Durban.